It’s lunchtime and we’re on stage at Melba Hall on the University of Melbourne’s Parkville campus. I’m one of 50 staff and students sitting and periodically standing at the behest of Yorta Yorta soprano Deborah Cheetham AO. We are, simply by implication of being here, the Reconciliation Choir. We parrot Cheetham’s lip trills, repeating, as we contort and touch our corresponding body parts, “toe, knees, chest, nut …”. To the non-chorist – i.e. me – it feels a bit embarrassing, but Cheetham puts things in perspective. Deborah Cheetham AO and Shauntai Batzke at Melba Hall. 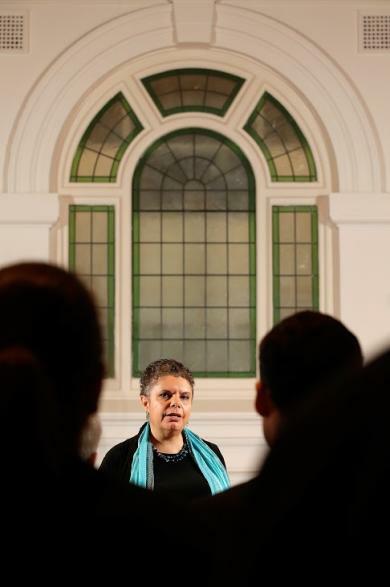 Later in the rehearsal she will describe the choir project as one of the highlights of her time as Associate Dean (Indigenous) at the Faculty of the Victorian College of the Arts and Melbourne Conservatorium of Music – good praise given she headed the Wilin Centre for four years, founded the Short Black Opera Company in 2009, wrote Australia’s first Indigenous opera, Pecan Summer, and has been a fixture in the Australian arts landscape for more than 25 years. 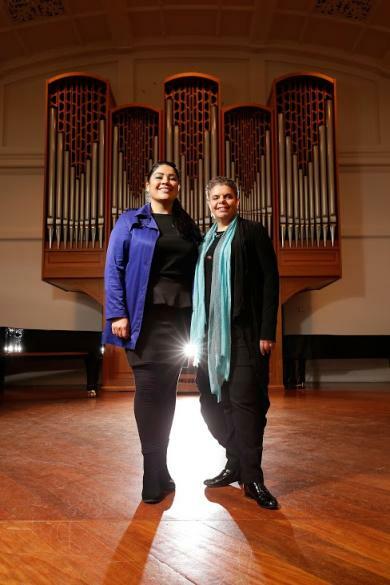 Standing next to Cheetham and the Steinway and Sons piano on stage is Wiradjuri soprano and University of Melbourne graduate Shauntai Batzke, for whom Womin Jeka Elements 2 was written specifically. Batzke has performed it publicly already in the Boon Wurrung language but today, reflecting the place of performance, we are singing in the local Woi Wurrung language. “When I first heard the song I absolutely fell in love with it,” she says. “Singing in an Indigenous language is very special because in the past we weren’t even allowed to speak our languages. It’s spiritual experience and I feel very blessed.”When we talk before the rehearsal, Batzke’s talent and potential is championed by Cheetham. She upped sticks from Sydney to Melbourne to join the Short Black Opera Company, through which she prepared to audition for a foundation course at the University, which in turn led to her enrolling in and completing a Bachelor of Music. Deborah Cheetham with the choir at Melba Hall. The pair first met during the intermission of a concert both were attending in Sydney in early 2009. Batzke’s husband thought he recognised Cheetham, the pair went over to introduce themselves, and Batzke mentioned that, in addition to working at FlexiRent, she did some singing. She showed Cheetham a YouTube clip of her performing a gospel song and they talked further. Seven years layer, she’s seen by Cheetham as her natural successor. That changed in 2010 when Cheetham brought together a company of 35 Indigenous opera singers to perform Pecan Summer, based on the 1939 Cummeragunja walk-off. “I don’t think Deborah is acknowledged and recognised enough for what she does,” says Batzke. “She’s now Deborah Cheetham AO, at least, which I remember as ‘Aboriginal Opera’. Shauntai Batzke discusses finding her path and taking her ‘big voice’ to the Met in New York. I feel gratitude during the choir rehearsal too, mainly because the gusto with which everyone else is belting out the song masks my own questionable attempts to reproduce phrases such asGamaguen Bundjil and Gamaguen Waa. “Pronounce the W as if you’re kissing,” Cheetham advises. And we try, we kiss. It’s fun, of course, but the choir project is not just for laughs. Shauntai Batzke sings Womin Jeka Elements 2. “We’re living through such a fearful culture of compliance,” says Cheetham. “Often it’s a case of, ‘Let’s say we’re going to engage with Indigenous people but let’s not worry about the quality of that engagement, as long as we can represent it on a graph. “That’s where an Aboriginal-led creative process will always win out – we ask the hard questions because it doesn’t serve us well to do otherwise. I can’t help wondering if it’s a drag for both women to constantly have their indigeneity brought to the fore by people like me, to not be recognised simply for what they are: two incredibly talented musicians and performers. 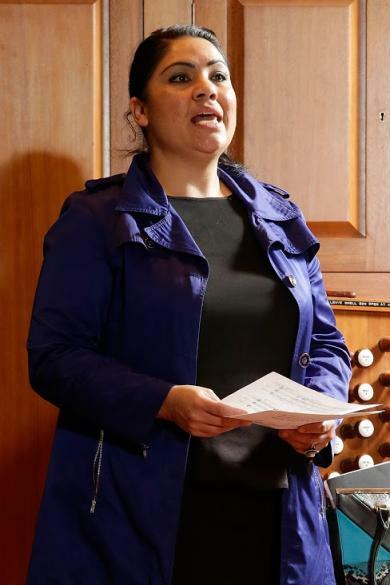 “I’m a soprano who’s Indigenous, but at the same time I’m an Indigenous soprano,” says Batzke. “I don’t even see the colour I am a lot of the time, and wonder why I get treated a certain way. And then I’m like, ‘Oh, that’s right, it’s because I look like this’. Looking around at Melba Hall, as we work our way bar by bar through the song, I’m reminded of Cheetham’s point, made earlier, that we’re not singing in a “foreign” language but an Australian one, available to anyone and everyone who would want to experience it.